Have you ever felt underwhelmed by the Hanukkah “miracle of the juglet of oil”? I have, and if you have too, it is probably because most of us are so disconnected from the land. We do not appreciate what an amazing accomplishment it was for the Maccabees to press all the olive oil they needed for the Menorah in only eight days. Hanukkah is a celebration of olive oil. Traditionally the oil is used as a medium for frying other foods. I think that the more appropriate way to savor the subtleties of olive oil is by making some of the most premium olive oil from Israel the main event. Served cold, with Israeli spices and warm pita, this oil brings us the fresh flavors of the Israeli olive fruit. When eating this oil, we can taste the foods that fortified Judah the Maccabee. The olive tree is an evergreen from the Mediterranean Basin. It is in the same family as lilacs, jasmine, and forsythia. This tree is very tough. It resists drought, disease, and even fire. If the tree above ground burns, its root system can still regenerate it. Olive trees can live for a very long time. Two ancient olive trees flourish in the Galilee villages of Arraba and Deir Hanna. They are over 3,000 years old! They were alive 1,000 before the destruction of the Second Temple in Jerusalem. There were forests of wild olive trees in Ancient Israel in the Galilee, Judea and Samaria, the Sharon Plain, and the Negev. The olive was one of the first fruit trees to be cultivated. Olive trees were initially planted in orchards in the Levant and Crete about 6,000 years ago. Archaeologists have uncovered the oldest amphorae, weights, mortars, and oil presses in Jericho. They were dated to 6,000 BCE. To this day Beit Zayit – The House of Olives, Har HaZayitim – The Mount of Olives, and Gethsemane – “Gat Shemen” in Hebrew, which means “oil press”, evoke the production of olive oil in Israel. According to the Talmud, once the Maccabees successfully rebelled against King Antiochus Epiphanes, they proceeded to rededicate the Temple in Jerusalem. They needed consecrated olive oil to burn in the eternal flame in the Menorah of the Temple. There was only enough oil which had not been desecrated by the Antiochus’ Syrian/Greek soldiers to last one day. Miraculously, the oil lasted for eight days, the amount of time needed to press more oil. In the days of the Temple, the olives were picked by hand or “beaten down from the trees with poles.” (Isa. 17:6). Oil was extracted from the olives with a mortar and pestle (Exo. 27:20), with a heavy crushing stone rolled around a stone basin, or by the feet, while wearing wooden shoes (Micah 6:15). The olive pulp was scooped into wicker baskets, and the lightest and finest oil would run off them. The resulting olive juice flowed into a stone collecting vat. After a few days, the oil rose to the top of the other liquids. It could be scooped out with a clay amphora. This grade of oil is the “beaten oil” which served as fuel for the Menorah in the Temple. Raw olives are really hard. In modern times, grinders with the strength of a garbage disposal are used to grind the olives. Most of what comes out when olives are crushed is water. Olives do not yield much oil. Five pounds of raw olives yield only one and a half tablespoons of oil! The golden pitcher which was used to replenish the Menorah contained 3.5 lug , or half a gallon of oil. The Maccabees needed to press 128 tablespoons of oil to fill it! This required them to pick and process approximately 426 pounds of olives! In the ancient conditions the Maccabees lived in, it really was perceived as a miracle that they were able to extract all the necessary oil in only eight days. The remaining olives in the wicker basket were pressed with a heavy stone. The oil that was extracted in this way was for consumption. This is cold pressed extra virgin olive oil. It is called “cold pressed” because the olives are pressed immediately after being picked, and are not heated. The juice of the olives is crushed, separated, and decanted. The oil that results at this stage is sometimes called cloudy olive oil, because it has not been filtered. This type of olive oil is becoming very trendy because it is less processed and more “organic”. Extra virgin olive oil is the highest quality of olive oil, comprising less than 10% of oil produced. The best olive oils are low in acidity. The acidity level of extra virgin olive oil is no higher than 0.8%. Extra virgin olive oil is supposed to have flawless taste. Virgin olive oil is produced without any chemical treatment, has less than 2% acidity, and a good flavor. Pure olive oil is a blend of virgin and refined oil. Olive oil is also a blend of refined and virgin oil, with less than 1.5% acidity. Olive pomace oil is extracted from the olive pulp using solvents. It can get much hotter before it smokes than virgin olive oil, so some people prefer it for cooking. Refined olive oil is virgin olive oil with a high acidity level. It is processed with chemical and physical filters to remove the acidity and is considered the poorest quality. Lampanate oil is not for eating. It is used in oil lamps. Purchasing fine olive oil is like purchasing wine. The flavor of the olive oil is impacted by the terroir (where it is grown), the type of olive used, how ripe the olives are when harvested, and how the olives are picked and pressed. Freshness is very important. Oil which was just produced in a region where olives are grown will taste better than an older oil. Once a bottle of olive oil is opened, it should smell like olives. Olive oil will taste good for a year, although it will become less fragrant with the passage of time. After a year, it should be used for cooking, and not served straight out of the bottle. Oxygen, heat, and light cause oxidation in olive oil, making it rancid. This process begins as soon as a bottle of olive oil is opened. The best way to store olive oil is tightly sealed, in a cool, dark place. If stored this way, a bottle of extra virgin olive oil may last for two years. Several olive varietals grown in Israel are used in the production of oil. The Syrian, which despite its name is actually native to Israel, is the first to ripen and to be picked. The Barnea, named for the Kadesh Barnea area where it was originally discovered, is picked early in the season while still green. The Arbequina and Manzanillo came originally from Spain. The Picual is a tiny olive, which ripens toward the end of the season, and is the last to be picked. There is a wide variety in the taste, color, and aroma of these oils. Like fine wines, premium extra virgin olive oils are blends of different kinds of olives. These different oils are mixed to achieve a balanced taste, which brings out the best of each type of olive. One of the best olive oils in Israel is the award winning Halutza Extra Virgin Olive Oil. The olives for this oil are grown in the Negev desert at Kibbutz Revivim. Fifty years ago, members of the kibbutz discovered an ancient reservoir of brackish water 3,000 feet below ground. Olive tree orchards were planted, watered exclusively by this reservoir. The hot days, cold nights, clean air, and salty water produce superior olives. Halutza olives are picked by hand. The pressing mill is on the premises, ensuring that the olives are processed within twenty four hours of being harvested. It is OU-P, Badatz Mehadrin. A festive way to celebrate Hanukkah is to whisk this oil into a dipping sauce and serve if with fresh, hot, pita bread. Finely mince the garlic. Sautee in the olive oil for a few minutes until the garlic turns golden. Allow to cool. Pour the oil and garlic into a bowl. Add one tablespoon of balsamic vinegar, and mix well. Sprinkle salt, red and black pepper, and cheese to taste. Serve with hot, crusty French or Italian bread. This Hanukkah, remember the Maccabees by indulging in golden extra virgin olive oil from Israel. Whether you mix it with spices for a dip, drizzle some of it on your hummus, or mix it into your salad dressing, infuse your Hanukkah meals with olive oil. Taste the flavors Judah and the Maccabees enjoyed as you appreciate their accomplishments and honor their memories. This year, the first night of Hanukkah comes unusually “early” in the solar year — Wednesday evening, December 1. As always, it comes when the moon is dark and the Earth is moving toward the winter solstice when (in the Northern Hemisphere) the night is as long as it gets, the sun is as dark as it gets. 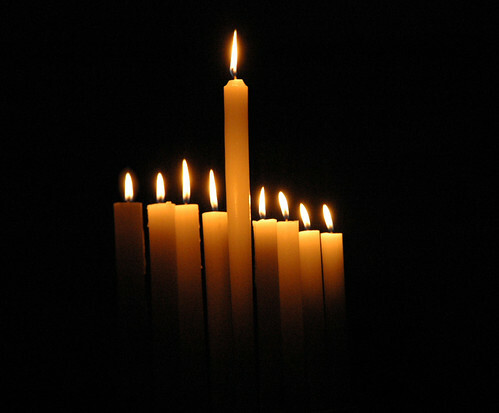 In this time of darkness, we kindle a gathering bank of lights. If we are feeling depressed or despairing about our country, our world, our planet — now is the time to kindle new light. There are three levels of wisdom through which Hanukkah invites us to address the planetary dangers of the global climate crisis – what some of us call “global scorching” because “warming” seems so pleasant, so comforting. The Talmud’s legend about using one day’s oil to meet eight days’ needs: a reminder that if we have the courage to change our life-styles to conserve energy, it will sustain us. The vision of Zechariah (whose prophetic passages we read on Shabbat Hanukkah) that the Temple Menorah was itself a living being, uniting the world of “nature” and “humanity” – for it was not only fashioned in the shape of a Tree of Light, as Torah teaches, but was flanked by two olive trees that fed olive oil directly into it. So we invite you to join, this Hanukkah, in The Shalom Center’s Green Menorah Covenant for taking action – personal, communal, and political – to heal the earth from the global climate crisis. Day 2: Congregation, Hillel, JCC, retirement home, etc: Urge your congregation or community building to switch to wind-powered rather than coal-powered electricity. Call your utility company to learn how. Day 3 (which this year is Shabbat): Automobile: If possible, choose today or one other day a week to not use your car at all. Other days, lessen driving. Shop on-line. Cluster errands. Carpool. Don’t idle engine beyond 20 seconds. Day 4: Your network of friends, IM buddies, Facebookers, and the members of civic or professional groups you belong to: Connect with people like newspaper editors, real-estate developers, architects, bankers, etc. to urge them to strengthen the green factor in all their decisions, speeches, and actions. Day 8: National: Urge your Senators to strengthen the authority of EPA (Environmental Protection Agency) to regulate CO2 emissions from coal-burning plants, autos, oil refineries, etc. — for the sake of our planet’s climate, and to lessen asthma outbreaks among our children. Some Senators and Congressmembers are seeking to cripple the EPA, mostly to protect Big Coal. Happy Hanukkah for you — and Planet Earth! • For more information, to explore having your congregation or community becoming a partner in the Green Menorah Covenant, or to arrange for Green Menorah resource people to visit your community, please contact us at [email protected] or (215) 844-8494.